With a teenager in the house it's always good to have some pizza stashed away in your freezer, so when I was contacted by FRESCHETTA® Simply…Inspired™ to try their new line of pizza I said sure! Freschetta Simply Inspired pizzas are made with top quality ingredients. They use real cheese, premium meats and their sauces are made out of tomatoes picked at the peak of their ripeness. What does this mean for you? Yummy pizza you can have at home in minutes - that's what! Freschetta offers delicious flavor combinations like Farmers Market Veggie, Southern BBQ Recipe Chicken, Harvest Supreme and lots more. We tried the Rustic Pepperoni Pomodoro and it was fantastic! Their FRESCH-TASTE SEAL™ Packing locks in the vibrant flavors, while using 30% less packaging material. Here are my friends Ashley and Bekka enjoying some Freschetta pizza - aren't they pretty! Freschetta sent me a bamboo cutting board/cheese tray - wasn't that nice! And guess what? They sent one for you too! 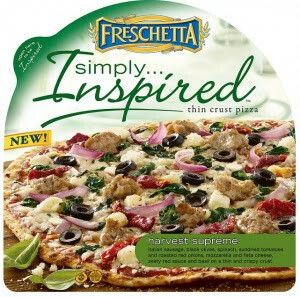 Along with a coupon to try your own Freschetta Simply Inspired pizza for FREE! Want to know how to win? First go to Facebook and "like" Me and My Pink Mixer. Then leave a comment on my Facebook giveaway post (not here) about what flavor of Freschetta Simply Inspired Pizza you would like to try. giveaways and follow them on Twitter @FreschettaSI too! Good luck. Contest ends May 6th.